People expected little of the Oscars this year. The 2019 award ceremony, although hostless, still found moments of surprise and intrigue, ranging from Spike Lee’s long-awaited statue to one of the more heartwarming –– yet awkward –– moments between “A Star is Born” leads Lady Gaga and Bradley Cooper where the two stars nearly kissed. The Oscars have come under scrutiny in recent years for a lack of diversity, stemming from both award recipients and even presenters. The solution? Award “Green Book” best picture. The Academy still took a step both to appease the public and to broaden its recipient horizons. Of the four awards given to individual performances, three were men and women of color. Rami Malek became the first actor of Egyptian descent to win Best Actor at the Academy Awards, while Mahershala Ali won Best Supporting Actor and Regina King won Best Supporting Actress. But Best Picture brought questions with little answers. In essence, the theatrical Cheney yearns for a subliminal seal of approval from Lynne Cheney, essentially seeking unimaginable executive power and privilege as his wife pushes him. “Bohemian Rhapsody” plays even looser with the facts. Rami Malek delivered a stellar, Oscar-worthy performance as famed Queen frontman Freddie Mercury, but the same cannot be said of the film. The film centers the success of Queen’s “Live Aid” performance around the revelation of Mercury’s AIDS diagnosis. In actuality, Mercury was diagnosed in 1987 and denied swirling rumors for years. But for its shortcomings, the Oscars found promise with several bittersweet moments. For Spike Lee, bittersweet comes short. Lee was infamously snubbed for “Do the Right Thing” in 1989. Lee took a moment, while accepting Best Adapted Screenplay for “BlacKkKlansman,” to discuss President Donald Trump and the importance of the impending 2020 election. It was a moment of bliss and triumph for Lee, who had paid his dues and then some for the opportunity to earn a statue. Until Bradley Cooper and Lady Gaga stole the show –– literally. 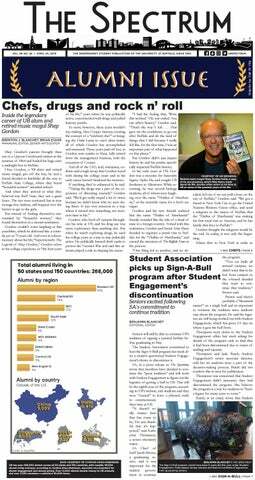 Brian Evans is the senior arts editor and can be reached at brian.evans@ubspectrum.com and on Twitter @BrianEvansSpec.